The chapel is at the bottom of Flowergate (see map). Although it is not shown on the road map, there is actually a pedestrian link called Golden Lion Bank between the St. Ann's Staith/Harbour bridge junction and the bottom of Flowergate. 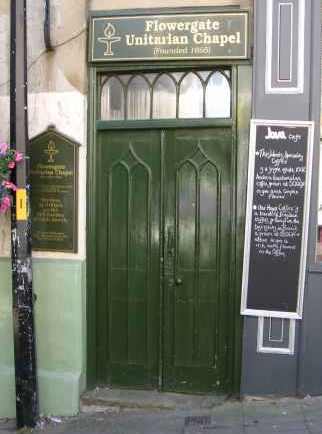 The chapel is not visible from the road, but you should look for the double green door and chapel sign as shown in the above photograph. The door is between the Sutcliffe Gallery and the Java cafe. Beyond this outer door there is a short passageway leading to the main chapel door on your right. N.B. The chapel is normally kept locked and is therefore only open for viewing at the times of the monthly service or when there is some special event/activity.